As I sometimes like to do when time permits, I made a card with the leftover papers from my latest scrapbooking page, inspired by the Simon Says Stamp Monday challenge (Things with Wings). I was in need of sympathy cards and the soft neutrals of the papers were perfect for this. I also had my folder Coluzzle template out that I had used for the page, so it was great to make a shaped card. I didn't work off a sketch, I just basically started with the items I had leftover, like the second half of the frame I had fussy cut out of one of the papers. I glued it to the folder, stamped "all of our sympathies" at the bottom of it and added a little paper banner, layered flowers and little butterflies die-cut with the Beautiful Wings Embosslits we used to carry. A matching envelope was made with the Envelope Punch Board, accomodating the unusual card dimensions. This might be one of my favorite sympathy/encouragement card I've ever put together. It was all inspired by the fabulous new Weather Together bundle from the annual catalogue (p. 55). There are so many great pieces in the stamp set and matching Framelits that I see a lot of fabulous creations with those items in the future. I also seem to have a thing for umbrellas as I've always picked the umbrella or characters with umbrella images when I shop. Not sure why - maybe because they can be made colorful? Anyway, this was one of the first thing I put on my mental first-order list when I first saw the catalogue. Then seeing the wonderful soft color combo from ColourQ #350 this week made me reach for this set. I was looking for a card sketch to go with it and finally found one I really liked in the July Card Maps sketches. I used the Festive embossing folder on the background, because the vertical lines could mimick raindrops. I pulled out So Saffron Designer Series Paper from a retired paper stack and used the front of the paper for the main block and the backside for the scallop border. I placed the two cloud Framelits on the Saffron paper to cut out frames. Then, I stamped the cloud images on a scrap of Shimmery White cardstock (FYI: this paper is thick enough to watercolor on, and it takes ink beautifully) in Basic Grey Archival ink and watercolored the clouds using Pool Party ink and a blending pen. Then, I put a few Stampin' Dimensionals around the clouds and placed the cloud images underneath, lining it up with the cloud windows. The Shimmery White cardstock was used for the umbrella as well so that I could watercolor the middle part of the umbrella in So Saffron ink. I stamped both sides with the polka dot image, and I embossed the cute border found in the Framelits set at the bottom. I wanted to use my new Detailed Floral Thinlits and decided to pair them with the Match the Sketch challenge #131. 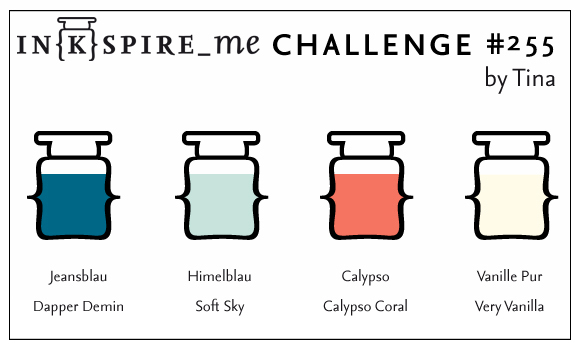 For colours, I picked the ColourQ combo #348. 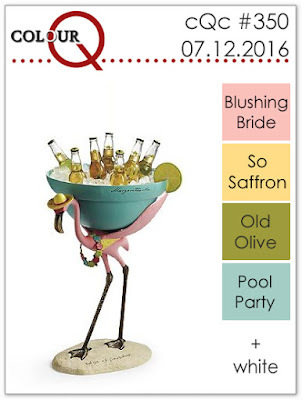 I didn't have some of the suggested colors, so I picked out current colours to form a similar combo: Peekaboo Peach, Pool Party, Night of Navy and Pear Pizzazz. This card was pretty straightforward since the Thinlits did most of the work for me. I love that the kit includes a Edgelits die, which allowed me to mat the detailed floral die-cut with a plain piece of peach cardstock and die-cut the edge to match the floral lace die-cut. 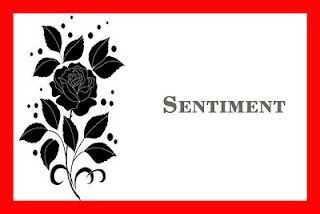 The tag and sentiment come from the Rose Wonder stamp set and reads, Sometimes words are not often. I used the new Affectionately Yours Designer Washi Tape underneath and a piece of Navy seam binding (now retired). When I saw the CAS(E) This Sketch challenge #178, I saw the opportunity to use the new Sweet & Sassy Framelits. I was really happy to see those hearts added to the dies collection. I like that we have hearts of all sizes, but also that we have two types of hearts: one that is more traditional and symetrical, and the other one with rounder edges, more whimsical. The beautiful colour combo was inspired by In[k]spire Me challenge #255, and it features one of the new In Colors, Dapper Denim. It's a nice darker shade of blue with green hues. It reminds me a bit of Not Quite Navy, which was a colour I used to reach for a lot. The nice Vanilla striped satin ribbon is retired, but still available in the Clearance Rack (while supplies last). What does not work for one card might work for another... When I stamped my lilac card earlier this week, I was not paying attention and initially did my tree leaves in Pear Pizzazz. Then when I snapped out of my temporary daze, I realized I wanted the leaves stamped in lilac, so I discarded my piece of white cardstock. Then I found it later in my paper scraps after receiving my new catalogue order, and I realized it would look great with the leaves picture paper from the Serene Scenery DSP. 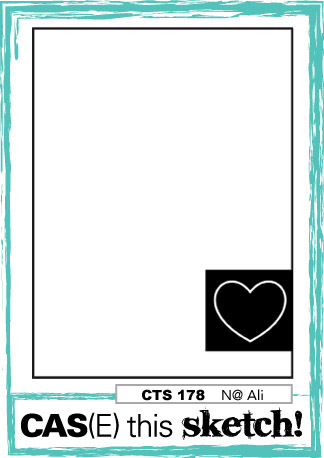 I centered my design around the Try Stampin' on Tuesday sketch #276, and in order to have the DSP showing, I had to make my card extra big (4½" x 6"). 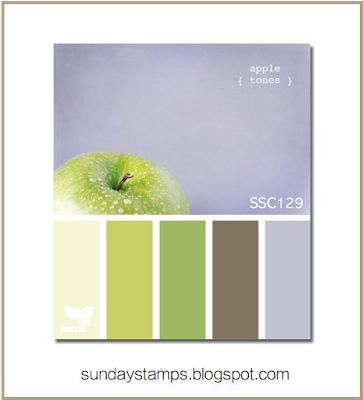 I thought the Sunday Stamps #129 color combo was really pretty. After fiddling a bit with color combinations, I finally settled on Wild Wasabi, Pear Pizzazz, Wisteria Wonder, Tip Top Taupe with a dab of Chocolate Chip and Sweet Sugarplum. I thought stamping a lilac tree with the Sheltering Tree would look lovely. When looking at sentiment options to create the circle embellishment (as per the Freshly Made Sketch #241), I settled on "Wholeheartedly with You" from the Heartfelt Sympathy stamp set. The sentiment was die-cut using the Layering Squares Framelits Dies and a bit of Designer Washi Tape was added and stapled in place. The Tip Top Taupe cardstock was stamped in Chocolate ink on Tip Top Taupe with the Hardwood background stamp (love the look!) and a piece of Sweet Sugarplum ruffled ribbon was added. So a former colleague of ours lost his mom and I was asked to provide a card that we could sign as a group. Even though I had made a few sympahy cards to keep on hand recently, it happened that the sentiments on them all had "me" or "I" somewhere, so it was not really working for a group card. I came home and looked through my Pinterest sympathy board to find something I could whip up together quickly. 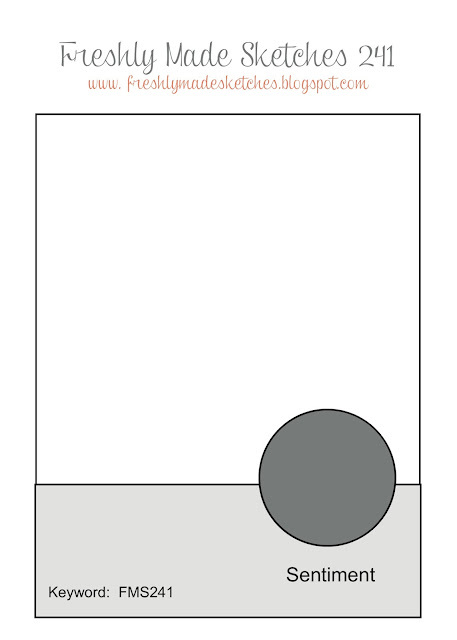 This card was adapted from a design from Lynn Weiss. Lynn's original card was nice and soft and had touches of soft blue on it. I gave the main image two tries, trying to achieve a similar look, and finally decided mine would be darker and that would be it. Those lovely flower silhouettes are from More Petal Prints, one of the first stamp sets I bought from a minicatalogue back when I started stamping and they are still one of my favorite flower sets after ten years (and heaven knows we've had our share of flowers since!!). Years ago, Stampin' Up! launched its Big Shot line and part of that first offering included a beautiful embossing folder called Manhattan Rose. I remember thinking back then that the embossing folder was great, but that a die with an intricate hollowed out rose would be what I really wished I had. Fast forward years later and the 2016 Occasions catalogue (p. 18) introduces Rose Garden Thinlits dies, with a matching stamp set (icing on the cake!). Exactly what I had been hoping for! This was one of the first item that went on my wish list. It helps that the stamp set includes a large variety of very useful sentiments (sympathy, wedding, thanks, birthday, comfort, happiness), in beautiful fonts. It should be no surprise that this is the first item I reached for this week after receiving my catalogue order. I was also curious to see how close it was to the Manhattan Rose folder image, so I pulled it out and used it for my card background. The color combo is inspired by the Hand Stamped Sentiments challenge #229 - Always Artichoke, Sahara Sand and Elegant Eggplant. Those understated colors were perfect for a sympathy card. By the way, I really like that frame from the samp set with the matching die. I foresee using this one a lot in the future, as it's a nice size that will surely house a lot of sentiments from other sets as well. The card design was inspired by Try Stampin' on Tuesday #254. I unfortunately got some request for more sympathy cards at the office, so I went hunting for ideas on Pinterest. I found a beautiful card from Alison Barclay that I copied as is. I simply changed the ribbon to use what I had on hand. The card background was sprayed with a Stampin' Write Marker and the spritzing tool to cut the white a bit. Those two cards are flat-out copies of Stampin' Up! samples from an older minicatalogue. I had always thought they were gorgeous and planned on copying them and it took four years before I got around to it. Better late than never, I guess! I simply changed the sentiments to turn the cards into Sympathy cards, since the black and vanilla scheme seemed appropriate. This is another card that was born our of my mission to create more sympathy cards. I pulled out one of my favorite current images, from the Life's Adventure hostess stamp set, and paired it with some scraps from a retired DSP pack called Urban Garden. I initially wanted to color my image using Stampin' Blendabilities Markers, but I didn't like how the fox (which I had colored in orange shades) looked paired with the DSP, so I switched gears and colored the image with blending pens on watercolor paper using inks. You like the little rain drops? They were created with the Cupcake punch, using what is supposed to be the flame! I used an adhesive sheet on the back of the Silver glimmer paper BEFORE punching so that my punched pieces already had adhesive on the back. That made my life much simpler when came time to glue the raindrops on the image. The image was die-cut using the Deco Labels Collections Framelits Dies, and since the sentiment was not fitting inside the Framelits I wanted to use, I stamped it again separately in VersaMark on a scrap of cardstock and embossed it with White Stampin' Emboss Powder. The back piece was punched using the new Ornate Tag Topper Punch, and I used the Dotty Angles stamp set to add polka dots to the right edge. I was leafing through old Stampin' Up! catalogues and stumbled unto a simply and elegant card that really caught my eye. I thought it would make a great addition to my sympathy card collection, so I put this card together in all of ten minutes. It uses some retired elements mixed with current ones. The card base was stamped with a beautiful background stamp that is now sadly retired, that was called Brocade. I woke this morning with a very clear vision of a sympathy card, design, colors and all. I immediately got up and put ink to paper to capture my idea. I didn't have any English sympathy card on hand, so I decided to use an English sentiment and found something that could work for a sympathy card in the retired Small Sayings set. The other images come from the retired hostess set called God's Beauty. The colors I paired are two new In Colors - Lost Lagoon and Mossy Meadow. The one detail the picture couldn't capture is the shimmer on the butterly. After stamping it in Mossy Meadow ink, I covered the butterfly with green Pearl Ex pigment. It captures the light beautifully when you move the card. The design was inspired by the Hand Stamped Sentiments Sketch #199. I was completely out of sympathy cards already so I wanted to use the retired set Branch out to make one. I centered my design around the Make the Sketch Challenge #33 and knew I wanted to use the new Typeset Specialty Designer Series Papers. Then, I decided to use the Woodgrain embossing folder on Basic Black Core'dinations cardstock to make my background. When I pulled out my Very Vanilla cardstock file to grab cardstock for my card base, a die-cut of a maple leaf fell out of the folder (die-cut with the Autumn Accents Bigz die). It was a leftover that hadn't been used on a previous project and that I had left with my vanilla cardstock. I thought it would make a great accent to go with the tree image, so I decided to include it in the design on a whim. The front panel is a piece of designer paper on which I embossed the tree in Black powder. I also stamped the splatter image from the Gorgeous Grunge stamp set in Gold powder. The center panel is a piece of Brushed Gold cardstock, which gives just the perfect subtle shimmer to my project. I used a piece of the new Gold satin ribbon (which is just luscious) and wanted to add a button on top. I first thought of the new Gold Basic Metal Buttons we carry in the Holidays catalogue, but the tone-on-tone wasn't popping enough, so I remembered the Very Vintage Designer Buttons. I also remembered a trick Shelli Gardner had shared at convention a little while back: rolling the top bottom of your bottom on your VersaMark pad then dipping it in Gold Stampin' Emboss powder. Beautiful result! I added a bow made out of Gold baker's twine as well. Here's my tip to you: The metallic baker's twine (silver and gold) comes undone easily, so don't even bother trying to put it through the button holes. It's too finicky and you'll lose your patience and your mind over it. I simply tied a bow and added it to the top of a button with a mini glue dot. Much simpler and allows for perfect placement! The sentiment comes from the Teeny Tiny Wishes stamp set. It is interesting to note that I've been keeping track of the use I've made of my supplies to see what I use most and what I don't use enough of and I noticed that I have used my Teeny Tiny Wishes stamp set on 74 projects so far!! Now, if that doesn't prove that this sentiment set is the most useful and versatile stamp set you can invest in, I don't know what will! It includes sentiments for all occasions and is the perfect size to fit on your project, whether it's on a tab, a punched piece, a little tag, etc. I try to vary the sets I use, but this is the one I always fall back on whenever I can't find what I need in any other sets. Notice how the envelope is decorated as well? This is a piece I salvaged from my first try, that didn't make it on the card. I tried doing a resist technique by embossing the tree in clear powder and rubbing ink around it. The Specialty paper is very, very thin (think dictionary pages) so the embossing on it wasn't as crisp as it usually is and I didn't like the look of the emboss resist. I was using So Saffron ink and we could barely see the tree amongst the dictionary entry, so I switched gear and stamped another image on another piece of paper. At the end, though, instead of chucking my initial image, I thought I would experiment with it. I wanted to know if I covered the whole paper with VersaMark then gold powder, if the tree image would show through once I heated the powder. It didn't, but you could kind of see the shadow of an image in the light because the clear embossing was a little thicker. Definitely not enough to be a main image, but I did like how we could see the dictionary text through the gold embossing. My first idea was to die-cut another leaf to decorate the envelope or the inside of the card, but then I decided to keep experimenting instead. I stamped the tree again in VersaMark OVER the embossing and added black powder, then heated. The image stayed in place but it did melt into the gold powder instead of being raised and the black image isn't as glossy as regular embossing is. It's a neat, different result, and I wanted to showcase it on the envelope. Goes to show that you can find some cool ideas when you try and reuse the leftover pieces you have on your craft table. I was low on sympathy cards at the office, so I made this quick card last evening. It came together really fast because I used an old Chatterbox kit which includes matching papers, textured cardstock, eyelets, tags, fibers and ribbons. All I added from my stash were SU! 's Designer buttons. I used Pensées empathiques, my favorite sympathy set. The flower was stamped in Whisper White ink and heat set, and then I stamped and embossed the sentiment in Pewter powder (another favorite).